Okay, after a long break due to computer issues, Alpha Cook is back in business. For this simple recipe you don't need a grill; the burger patties are too wet for grilling, so you'll want to pan fry them. To make it as healthy as possible, ask the butcher for ground turkey breast, instead of mixed or dark meat. There are two ways to do this, depending on your preferences. You can take about 6-8oz of (light) mayo, and whisk it with 1-2 tsps of prepared wasabi* OR you can use about 4-5 oz of mayo and blend it with a few Tbsp of sour cream for a thicker, slightly less fattening alternative. I usually prefer to add the sour cream. *I typically buy prepared wasabi in a tube that you can find in most grocery stores, near the Asian food stuffs. As an alternative you can use powdered wasabi, but the mayo mixture will need to sit for a few hours for the flavor to really take hold, and usually the texture is not quite as smooth. Mix the meat and all other ingredients well, until the egg is completely integrated. Let the mixture set for a few minutes. Form the meat into four patties. Meanwhile, heat a large (preferably nonstick) skillet, adding the oil so that it covers as much surface area on the pan as possible. Add the burger patties and cook for 4-5 minutes on each side. They should have a nice golden brown outside when you're done. Serve with lettuce, onion, and wasabi mayo. A little sliced radish is also a nice touch. *For more information on this tasty ingredient (Furikake) and another way to use it, go here. This sounds really amazing! 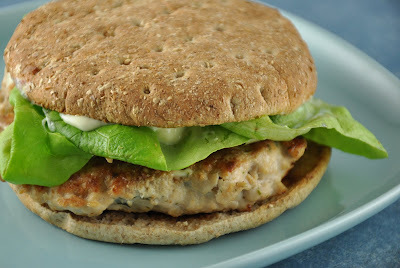 I've been looking for some unique turkey and chicken burger recipes lately. I am definitely going to try this recipe if I can find some Nori Furikake. These sound delicious and I don't even eat burgers! I love the wasabi mayo spread. What is the bun? Is that whole wheat? It almost looks like an English muffin??? Oh, I should have mentioned the bun. Those are Oroweat Sandwich Thins and they make great burger buns if you don't want a lot of bread. And yes, they're whole wheat too!